Our product range includes a wide range of non-sparkling adjustable wrench, non-sparkling pipe wrench, non-sparkling open end wrench, non-sparkling double end open spanner, non-sparkling hammering striking open spanner and non-sparkling combination spanner. We offer Non-Sparkling Adjustable Wrench which are handy tools used for loosening, tightening or fixing any kind of nuts and bolts. These have a "jaw" which is the part into which the nut or bolt goes. Our spanners are offered with adjustable size, which allows different sized nuts and bolts to be handled by the same spanner. Non-Sparkling Pipe Wrench. Pipe wrenches are required for varied mechanical applications and our range of pipe wrenches serve the exact purpose. Our manufacturers ensure that these are manufactured in accordance to the recommended industrial norms assisting us to cater to our clients’ diversified requirements. With proper storage and packaging the quality of our range remains unchanged. 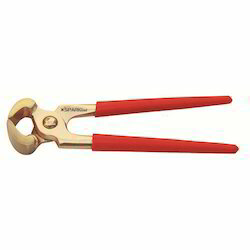 Non-Sparkling Double End Open Spanner are Most Suited For application purposes in potentially Explosive Environments. Most of our Non Sparking Tools are Forged after Casting to achieve better Quality, Performance & Attractive Finish. Widely used in a explosive and flammable place; holding and bending metal parts such as wire, pipe ,sheet , etc. To break and strip wire, hammer and make nails up. Our range of hammers are offered in various kinds some of which are ball pein hammer, cross pein hammer, machinist hammer, club hammer, sledge hammer, claw hammer with tubular handle, lady claw hammer, chipping hammer with spring handle and various others. Owing to the diversity in our range this range of ours are used for various application areas. 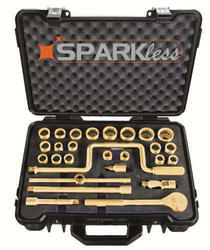 Non Sparking Tools are Most Suited For Application Purposes In Potentially Explosive Environments. Most of our Non Sparking Tools are Forged after Casting to achieve better Quality, Performance & Attractive Finish. Available in all Sizes. Application Purposes In Potentially Explosive Environments.Most of our Non Sparking Tools are Forged after Casting to achieve better Quality, Performance & Attractive Finish. Available in all Sizes.